I wish this book had been written two years ago. My mother told me recently that when Thomas was ill, it was very clear that I was in denial, much more so than Thomas himself. I wish so much that any of the many doctors and nurses had broken through my denial to force me to face the reality, but I can only be so mad at them because maybe some tried but just couldn’t reach me. So, the subject matter is upsetting at some times and comforting in others. He reveals ways in which the medical and elder care industries have disconnected from treating actual people – with much higher priority being given to longevity over quality of life. He also showcases some incredibly innovative solutions that are currently being attempted, with some very funny stories about the trial and error process, including a delivery of 100 cageless parakeets in one instance (this turned out to be a success). All in all, Being Mortal is just an incredibly important book. 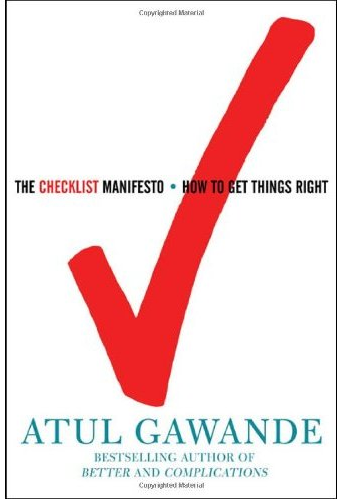 I am quickly turning into an Atul Gawande fanatic because I remember feeling the same just after reading his earlier book, The Checklist Manifesto. He has this way of taking material that should be incredibly boring or unpleasant to read about and approaching it through a very human way that makes it easily accessibly and engaging. To start off, this is a really excellent book and I recommend it to everyone. I’ve reviewed a few management books in the past, but this one is by far the best one, in part because it’s less about managing people in specific scenarios and more about managing complex situations in general, and in part because it’s focused on a single recommendation and discusses how and why that recommendation is important. As the title says, the book is about the importance of checklists. As a manifesto, it set out to convince me of its premise: that checklists can be used to great effect. It succeeds. I am thoroughly convinced and now think you should be convinced, too. A lot of jobs today are incredibly complex and only getting more so as time goes by. Checklists can go a long ways towards helping to compensate for this extreme complexity. The examples Gawande uses are surgery (Gawande himself is a surgeon), aviation, building construction, investment analysis, and cooking. Historically, these jobs were all performed by individuals relying solely on personal experience and instinct. Now, these jobs are most often performed by teams of experts with access to vast quantities of research in addition to their own personal knowledge. This is an improvement, of course, but it also introduces problems of complexity in having to coordinate with multiple people and incorporate excessive amounts of information. In performing these jobs, the professionals need to know and be able to instantly recall more detailed information than is really possible and they need to be able to trust that their teammates are performing equally super-human mental tasks as well. Such trust is often a mistake. When dealing with extremely complex tasks, professionals will sometimes focus so much on the difficult or tricky portions of their tasks that they forget to perform the basic preliminary steps. Even the best and most experienced experts in their fields are still just human. Checklists, however, can supplement memory to ensure that everyone remembers the basic steps, while at the same time running through a checklist as a group can ensure that everyone on a team is on the same page. I would love to go through each of Gawande’s examples and explanations because the examples were all so interesting and the explanations were all so useful. For example, the discussion of how airplane pilots came to use checklists and why they go through some every single time they fly, no matter how experienced they are, is fascinating. Equally fascinating is the interview with Boeing’s master checklist writer regarding what defines a good or bad checklist. The whole book is both interesting and useful and I could burble on about each of the stories or arguments or lessons, but really, it’s probably better if you just go and read the book.